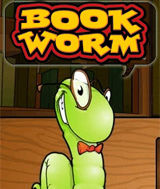 Link letters together to form words, then feed these words to Lex the Bookworm. More, and more satisfying, words fill him faster and net you bonus points. Take on this mental challenge at your own pace, but watch out for those red tiles: they might burn up your library and all of Lex´s snacks. Comments: Engaging, engrossing and just plain fun. Far from brain candy for the masses, this game requires to use and expand your linguistic skills. Comments: This is my type of game to play. Love it.